Is Rupert Murdoch the Biggest Purveyor of Fake News? Yesterday, I put up a piece commenting on a report in the I newspaper that the BBC had decided to set up a special team, Reality Check, to rebut fake news on the internet. James Harding, the head of BBC News, said that this wouldn’t be about policing the internet, and it wouldn’t attack the mainstream press. This all rings very hollow, as at least in America, faith in the mainstream news outlets is at an all-time low. More people are turning to alternative news sources on the internet as a reaction to the bias and misreporting of the established news outlets and broadcasters. And the Beeb certainly has plenty of form when it comes to bias. Like editing the footage of the battle between the strikers and the police at Orgreave colliery during the Miners’ Strike, so that it appeared to show the miners attacking the police. The reality was the complete opposite. Barry and Savile Kushner in their book, Who Needs the Cuts, point out that the Beeb rarely allows a dissenting voice to be heard against austerity. When one is heard, they are interrupted or shouted down by the presenter, keen to maintain the government, establishment view at all costs. And Nick Robinson himself did a piece of deliberate misreporting worthy of TASS or Goebbels during the Scots referendum. He asked a question Scottish independence might have on the financial sector north of the border. Salmond answered it fully. This was then gradually edited down over successive news programmes, until it vanished altogether, with Robinson claiming that Salmond hadn’t answered the question. So there’s plenty of very good reasons why you can’t trust the Beeb. Now there is a considerable amount of fake news on the Net. The American elections have thrown up any amount of pure rubbish. In addition to the usual weirdness from the Ufolks, which claimed that Putin had told the Russian armed forces to prepare to defend the motherland against extraterrestrial invasion, there were the tin foil hatted claims of Alex Jones. Jones, the head of the conspiracy news site, Infowars, had come out with some truly barking, and very dangerous comments about Hillary Clinton. He claimed that she was part of some Satanic cult, which was abusing children from a pizza parlour in Philadelphia. She was also supposed to be demonically possessed, like Barack Obama, and may have been an alien or robot, at least in part. It’s entirely bogus, along with the reports others put up claiming that she suffers from a neurological illness contracting from eating children’s brains. But the mainstream media has also produced bogus news. And one of the worst offenders is Fox News. Someone analysed how many of the stories Fox reported were actually true, and came out with the statistics that about three-quarters of the time they were rubbish. Put simply, if you watch Fox, you will be less informed that someone who doesn’t. There’s a reason why the network’s earned the nickname of ‘Faux News’. It’s very much like the old clip sometimes added to pieces on the internet, in which a man upbraids another for making an answer so stupid, that it’s lowered the IQ of everyone in the room, and the other needs to apologise. Well, that’s Fox writ large. Fox News is also on the internet, along with many other newspapers and channels. So you can watch Bill O’Reilly tell lies about his career there. O’Reilly’s one of the channel’s veteran anchors. He was caught out claiming that he was actually in the Falklands or nearby parts of Argentina reporting during the Falklands War. He also witnessed a sectarian riot in Northern Ireland, and was present outside the house of one of the witnesses of the JFK assassination when he committed suicide. In fact, this was all shown to be bilge. In the Falkland’s conflict, for example, he was safely several thousand miles away in Buenos Aires. Will the Beeb try and rebut some of the barking stories reported by Fox? No, of course they won’t. Fox is a mainstream news source, and is part owned by Rupert Murdoch, who also owns the Times and the Scum over here. The Scum is notorious for its bias and mendacity, but somehow the Times and its sister paper, the Sunday Times, has managed to avoid this. Sometimes you wonder why, as the Sunday Times has also carried bogus stories. Like the time it claimed Michael Foot was a KGB agent called Comrade Boot, for which the former Labour leader successfully sued for libel. And then there were the ‘Clinton Crazies’. These were a group of journos around the Sunday Times and the American Spectator, who believed that Bill Clinton was a violent mobster. The former governor and US president was supposed to be importing cocaine from South America through an airfield in his state. He was also responsible for ordering the deaths of 20 + aids and other figures, who had displeased him. One of the journos responsible for this nonsense was so paranoid, that during an interview with another journalist he kept the curtains closed, and anxiously peered out into the street at various intervals, in case ‘they’ were watching him from a parked car. One of the hacks, who produced this tripe later saw reason, and appeared on one of Adam Curtis’ documentaries stating very clearly it was all crazy nonsense. But the Sunday Times published it. But the Beeb very definitely isn’t going to tackle Murdoch’s rubbish, because Murdoch is the favourite of the various parties that have occupied No.10 in recent years, both the Tories and New Labour. In exchange for favourable publicity for the Murdoch press, they’ve been very happy to concede greater advantages to the media mogul, despite numerous conflicts of interest and the construction of a near monopoly in private broadcasting. Murdoch hates the Beeb with a passion. He’s been demanding its break up since the 1980s, publishing stories attacking the Beeb at every opportunity in his papers, including the Times. And so with the threat of privatisation now made extremely clear by the Tories, the BBC will very definitely not want to show how mendacious Fox is. So you can expect the Beeb to crack down on the alternative news outlets on the Net, under the pretext that it’s fighting the rubbish put out by Jones and co., while doing nothing about the fake news churned out by the establishment. Like the Murdoch press, and the Beeb itself. This sounds like a joke, and it shows the corporation’s utterly dismissive attitude and contempt for the British Left, and those, who have rightly accused it of Conservative bias. I found a small piece in last Friday’s I (8th October 2016) reporting that the Beeb wanted to recruit for more Conservatives to its newsroom team, in order to correct a perceived left-wing bias. Perceived left-wing bias? By whom? No, scrub that – no need to ask that question at all. It’s obvious who’s accused it of ‘left-wing bias’ – the Conservatives, in order to make sure that theirs is the only voice that’s heard. But the reality is the complete opposite. The Corporation has been repeatedly criticised for its right-wing bias. In a study by academics at Glasgow and Edinburgh universities, it was found that the BBC was far more likely to interview and treat seriously opinions by Conservatives and businessmen over left-wingers and trade unionists. 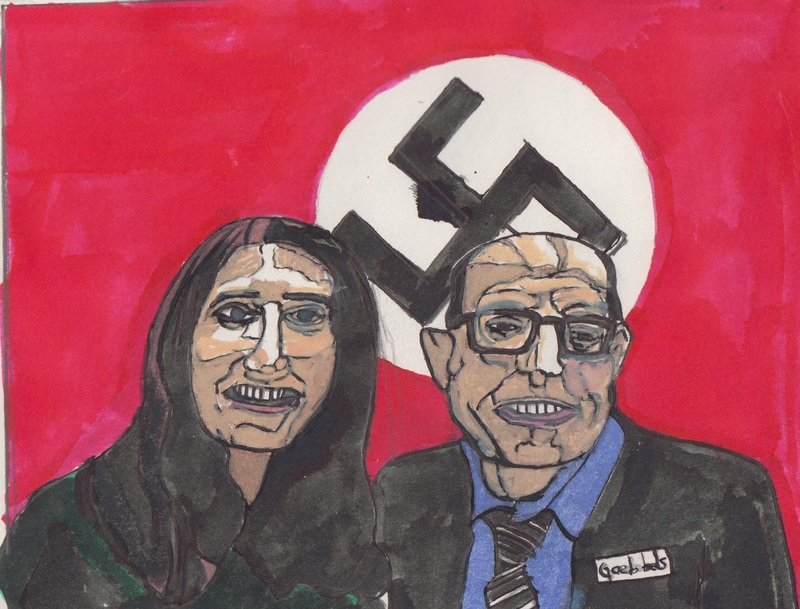 Barry and Saville Kushner, in their book Who Needs the Cuts, described how they were motivated to write it after seeing the way journalists covering the government’s austerity policies on the news time and again accepted without question the fact that it was all necessary. Those individuals and experts they had on their programmes, who dissented where either cut off or challenged. Another academic study a few years ago found that the Beeb was also biased in keeping very silent about the government’s privatisation of the NHS. Tens of thousands of people signed an online petition against the egregious Tory bias of the Beeb’s head of news, Laura Kuenssberg. The petition was attacked and sneered at as ‘misogynist’. Kuenssberg couldn’t be biased. All these people accusing her of it just resented the fact that she was a woman in charge of news. It was all rubbish. As Mike pointed out in one of his articles, instead of the hundreds or thousands of misogynistic comments posted by the petition’s signatories, those going through it – all 33,000 odd posts – could find only one that could be reasonably said to be such. But that’s how this country’s corporate media deals with any accusations of bias. Then, in the debate over the Scottish referendum a few years ago, there was another case of blatant censorship by the Beeb’s Nick Robinson. Robinson had asked the then leader of the SNP, Alex Salmond, a question about how independence would affect the Scottish financial sector. Would it result in the major Scottish banks and financial centres moving south to London. Salmond replied, but the Beeb edited the footage to make it first seem that he had evaded the question, and then edited his reply out altogether. Robinson intoned in a voiceover that Salmond hadn’t given him an answer. The Beeb is scared of the Tories, as they keep on threatening it with privatisation, all on behalf of their sugar-daddy, Rupert Murdoch. And since the rise of Accuracy In Media, the Republican organisation devoted to detecting liberal media bias in America under Ronald Reagan, the Tories over here too have joined in accusing the BBC and anyone else, who doesn’t toe their wretched line of having a similar bias. It’s got to the point where there are even jokes about this constant, resentful complaining from Conservatives. There’s a joke that if you go into a room, in which there are 99 Republicans and 1 liberal, those 99 Republicans are all moaning about the left-wing bias in the room. There’s also another one about how many Republicans it takes to change a light-bulb. 10 – one person to screw in the bulb, and another nine to complain about the left-wing bias of the screw. The Beeb’s already extremely biased towards the Tories. How long before its quest to become even more biased leads to it becoming an object of ridicule? Unfortunately, this is no joke. It’s another campaign to produce even more Tory propaganda masquerading as balanced news. And it all shows how massively biased against the Left the Beeb already is, and it’s craven prostration before the demands of the Tories.